Discussion in 'Epiphone SG' started by seedlings, Jul 30, 2014. This G-400 can't properly intonate because several saddles are at the end of their travel. 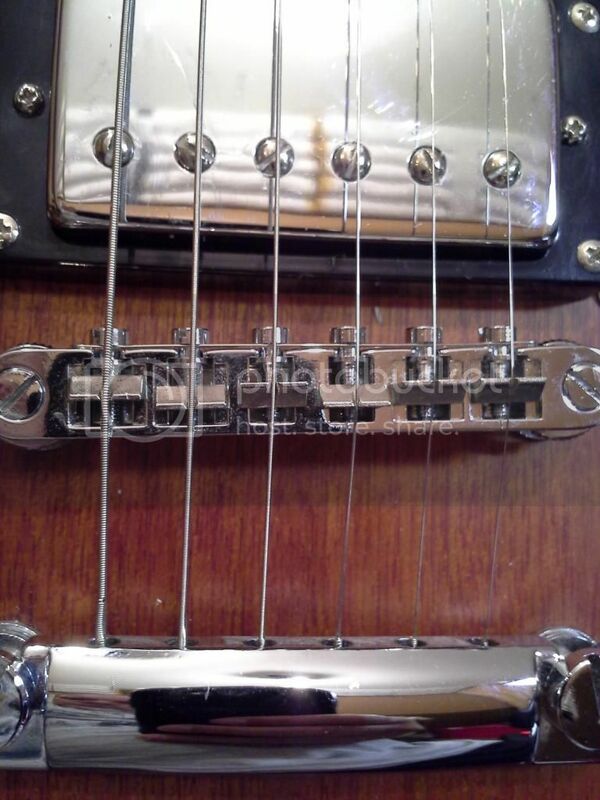 The common refrain is, "replace the bridge with an Gotoh (or TonePros, etc.)." I have no doubt it will help performance. But, specifically, I want to be sure to get a bridge with more travel for the saddles. I like the look of a Harmonica bridge, and I like the idea of a roller bridge, but I really want one with more travel... if it can be a harmonica or roller, then all the better. Drop-in would be necessary. Open to suggestions, so thank you! I deliberately turned a couple of saddles round to equalise the forces front and back, but I really need not have bothered. The only pertinent question I can ask is how high is your action? What's a backwards saddle? They do exactly the same job whichever way they face, but reach the end-stops better if they face the appropriate way. I've just taken a look at the tonepros bridge, and it looks like the intonation range is, if anything, less than the standard bridge. It won't fix this problem. Action was where I started, because I put 9s on, though I didn't get feeler gauges out. It's low with no buzz, but not as low as the Parker or the Fender. If you need numeric measurements, I can get those after work. No need for measurements - if it is low, that's fine. Did you try a new set of strings - and if so, did that make any difference? That set of saddles makes no sense to me. I put a Gotoh on my LP100 specifically for this problem. It has more saddle travel than the stock Epi bridge did, which mostly fixed the problem. I finally had to go to a lighter string gauge (12s!) to fix it completely. No experience with harmonicas or roller bridges. What tuner are you using to intonate with? Most electronic tuners aren't precise enough; you need to use a strobe one, or a simulator of a strobe tuner. I like LSTune, it's free, and there are some free smartphone apps too. The suggestions of looking at your whole setup holistically are wise too. The higher your action is, the more you stretch the string when you fret so the further out your intonation has to be. seedlings and JohnnyGoo like this. Using the boss TU-3 tuner on the pedal board, same as setting up other guitars. Process is set action, tune (always in playing position), verify open string tune with 12th fret tune, adjust saddle, repeat. Triads around the 12th fret and up are out of tune on this one, but fine on other 3 guitars, but could be tuner issues. Just had a thought... I'm not used to the SG neck yet, so maybe it is giving a little while fretting 12? You need a light touch on an SG neck - it is very whippy compared to many guitars, but if you are just gripping and not pulling or pushing, that should not be a problem. 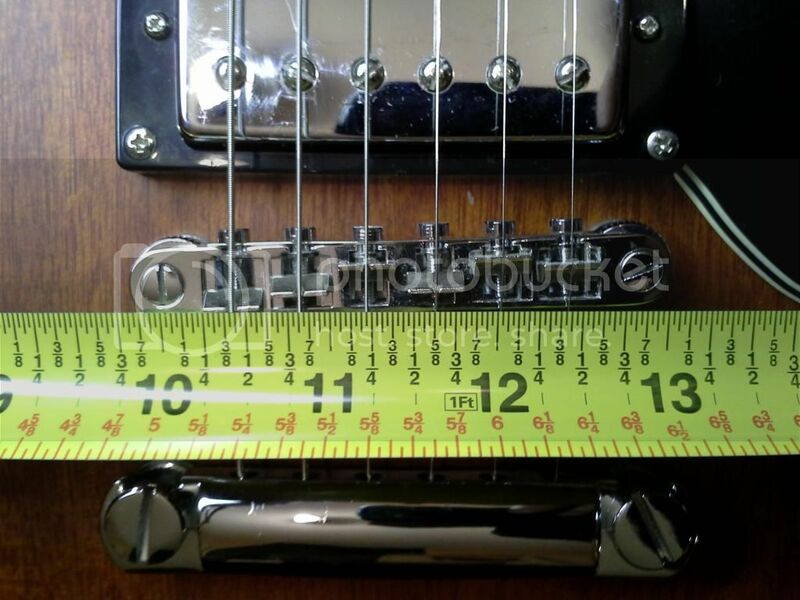 An ordinary tuner is perfectly good for setting intonation. I use a PC app called APtuner - it will do a full screen meter, and it has a really good feature which is a moving graph display of the pitch of all the major harmonics simultaneously. When tuning the lower strings, it is sometimes more tuneful to pitch the second harmonic rather than the fundamental. The guy I bought the guitar from said he thought the original strings were still on the guitar (2003, mind you). I replaced the strings with Ernie Ball Super Slinky, and then re-did the setup and then intonation to find this problem. I might have a pack of GHS boomers somewhere that are 10s or 11s. Doesn't this look better? What a relief (pun). After you guys asked about string height and relief, the feeler gague came out. The relief was two sheets of paper (instead of one) and the string heights were about 3/64 too low. On average it felt fine, but... after setting up to actual Gibson SG specs, she's intonated! Whew! Now I can stop obsessing over which bridge to maybe buy.